An AP report on the front page of the San Diego Tribunes business section Saturday boggled my mind. A $26 a month pay raise for 300,000 workers in China making our cell phones, IPods and computers. TAIPEI, Taiwan (AP) — The Taiwanese electronics company buffeted by a spate of suicides at its China factories said Friday it will raise the pay of workers by an average of 20 percent. The pay raises at Foxconn Technology Group have been in the works for months to cope with a labor shortage following China's recovery from the global recession, said a company official speaking on condition of anonymity because he was not authorized to talk to the press. . . . . The basic salary at the China plants of Foxconn Technology Group — which makes iPhones and other popular gadgets — is currently about 900 yuan ($130) per month. . . . . The company, part of Taiwan's Hon Hai Precision Industry Co., is the world's largest contract maker of electronics. Its long list of big-name customers include Apple Inc., Sony Corp., Dell Inc., Nokia Corp. and Hewlett-Packard Co.
Cheap labor runs the industrial world. A manufacturer that can sell it cheaper and better will make money. You have to marvel on how these workers can survive on the present $130 a month. Just imagine if they took out for Health care and Social Security. It does explain how electronics in this country are so cheap. Of course if that’s all you are being paid, you can’t consume very much either. Here is a link to a CNBC video with Steve Wynn. He is a big resort owner in Las Vegas who needs inexpensive labor to keep his hotels running. In essence, Obama’s new health care plan adds 2 dollars to the minimum wage (the employer’s share). Of course the employee gets to kick in a matching 2 dollars. If we figure the minimum wage right now at $8, add $2 for employee SSI and unemployment benefits then add $2 from the new health insurance costs, and calculate employee cost per month; $12 X 40 hours X 4 weeks, $1,920. Let’s see if I have this right. The monthly wage of Chinese laborers is being raised to $156 dollars per month, and stateside the minimum wage will soon be $1,920 a month. If a manufacturer wants to produce a retail product for consumption, they’d be an idiot to produce it in this country. On the other hand, if the business deals in servicing customers, the employer is caught paying the going rate unless it can be accomplished by phone support based in some third world country. Steve Wynn from the link above is taking advantage of this dichotomy in the world economy; gambling is a service business. His move to Asia allows him to offer 10 times more in service and still pay less on the bottom line. A lot of medical procedures are going offshore also. India offers open heart surgery at one third the price in the US and that includes airfare. The question arises, how do we recapture our industrial base that has moved offshore? I guess the real question is; “Why bother?” China is still advancing us credit, by buying our Treasury’s on the “Fog a Mirror” plan. It worked great for us for a while, in real estate. I guess this is where I keep quiet; we’ll let China figure this out the hard way. TRENTON, N.J. (AP) — A crowd estimated at 30,000 to 35,000 people gathered Saturday near New Jersey's Statehouse to protest Gov. Chris Christie's proposed budget cuts. State police, who gave the crowd estimate, said no problems were reported. The crowd is believed to be one of the largest ever to protest in state history. It was mostly composed of public employee union members and several community and nonprofit groups that would lose some or all their funding if Christie's plans are adopted. Christie has called for workers to accept wage freezes, and he's pushed for them to contribute toward their health benefits. Christie has called for workers to accept wage freezes, and he has pushed for them to contribute toward their health benefits. The governor was not in the Statehouse on Saturday and was not at the rally. The Republican governor has said that protesters have the right to speak their minds. Here is a Link to a very dynamic and entertaining video by New Jersey's Governor Christie, that explains what is happening (it's 26 minutes long). His plan of action is quite impressive, it is drastic. Here is a governor that isn't all talk. We need more people like him, but as he suggests, it won't get you re-elected. This is the sort of news that defined the Great Depression of the 1930's; hardship and protests. It was a sign of the times. A pension plan is a form of savings that allows one to retire with a predetermined monthly income. It’s a little like putting money in a savings bank until you retire. A pension fund is a little more sophisticated they employ all sorts of advisors to figure out what your monthly payment from them will be when you choose to retire. In order to come up with these projections, they have to know beforehand your monthly contribution, the average life expectancy and a projection of future interest rates. From there it is a pretty cut and dry calculation. Let’s examine it in a more simplified form. Assume that we have a person ready to retire with one million dollars in cash in the bank. That’s his total retirement. If we compute the interest rate on that at 12%, it comes out to about $120,000 a year. At 8% we get $80,000, at 4% we get $40,000, at 2% we get $20,000 and at 1% figure a whopping $10,000. Just examining the return rates here, it is easy to realize that a mistaken assumption of where interest rates will be, changes your spending habits and could force you to tap into the principle as well. Examine the rule of 72. Divide the interest rate into 72 and you have a pretty good idea how many years it takes for your savings to double. It also works quite well for inflation. Divide the inflation rate into 72; only in this case we are not doubling, we are halving. Figure that the banks are paying 2% interest. That is about 36 years to double your money. Inflation is around 6% so figure 12 years down the road, you’ll still have a million dollars, but only half the buying power. The difference between say CalPERS (California Public Employees' Retirement System) and an individual savings account used for retirement is that the left over funds in a savings account goes to your heirs. Pension funds don’t need a big cushion. They know that everyone as a group will drop dead at age 78 by using actuary tables. Every year in the past CalPERS was asked, "Is there enough money in the plan to carry everyone to the drop dead age?" At 7.75% interest with no loss of principle, the answer was "Yes." Well, CalPERS lost 56 billion and the interest rate is now about 1.5%. Rates can’t stay this low for 20 years, like Japan, now can they? So this is only temporary. Now that you’ve bought the bridge, can we interest you in a toll booth to go with it? The picture below is an excerpt from a Stanford study requested by the Governator's office, published in April of 2010. Here's a Link to it. Notice that CalPERS is using a 7.75% interest rate for their calculations and Stanford at the time chose 4.14%. The present attainable interest rates are in a range of 2 to 4 percent. CalPERS whole financial structure was built on 8%. This low interest rate was not anticipated. If we were to take their present asset base and double it, that doubling would generate the interest income needed, to keep the fund solvent. As usual, I could be shot for this over simplification. It seems certain that things are going to get worse before they get better. This Stanford projection of future pension costs appears quite reasonable. The three retirement funds cited in the report could have a half trillion dollar short fall. The size of the shortfall amount appears absurdly large, the possible reality of it, is rather unsettling. Governor Schwarzenegger has stated that the California pension plan program is unsustainable. At the same time CalPERS wants 600 million more of State funds for just this year. Who do you listen to? One thing to consider, our next governor won't work for $1 a year. A lot of states are coming to a fork in the road; how to live within their budget. Here in California, teachers, firemen and police have already gotten their budgets trimmed. Now it is time for deeper budget cuts or entertain the idea of raising taxes. The Republicans are dead set against tax increases and more or less figure if you pay no taxes in, you’re first in line to lose benefits. In essence, it's the free stuff that the poor qualify for. We have two political philosophies that differ immensely. California’s problem is a financial one created by an economy that has gone sour. If the economy was in good shape, this problem would not exist. The question arises, will either political view, result in a solution? Sadly, probably not. From looking back at history, raising taxes in hard times (the Democrats plan) brings in less revenue and stifles the creation of new businesses. Of course if you are poor and your entitlements get cut (The Republicans plan), you will vote for the Democrats to get them back. Both perspectives appear doomed to failure. Where else can the state governments cut? There are limits here; people expect and demand services for their tax dollars. The part of the budget that might end up being cut could be welfare and health care. 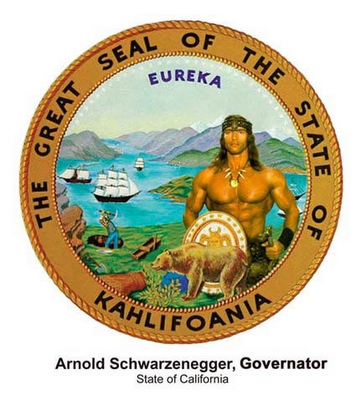 Governator Schwarzenegger is suggesting elimination of some welfare programs. However it seems more likely that California residents might see an across the board cut in welfare benefits of say 25% this year and another 25% the following year. This would put our state in line with the benefits other states pay. We could also see major cuts in health care. Health care for kids could flat out disappear. And as if it couldn't get any worse, new laws will prevent four million Arizona "tourists" from their annual trek to the San Joaquin Valley in California to harvest vegetables this year (a definite crimp on "tourism"). This should have no adverse effect on this years bumper pot crop. It kind of looks as if those that don't help row and bail water out of the boat, get to swim along side. Interest rates right now are a joke; Banks are paying ½ to 2%. My wife and I stopped buying T-bills that were paying a ¼ percent. Interest rates usually measured risk, the lesser the risk, the lower the rate. Look at bonds as a long term investment. The investor might be willing to take more risk to increase his rate of return. If there is no risk (because of government guarantees), the interest paid will approach zero. With inflation running in a range of around 6 to 15 percent (pick a value) bonds look like a real dumb investment. Consider that the bond market is 5 times larger than the stock market, where is money going to go? The stock market appears to be the only option left. The real question is, what level do interest rates need to rise to keep money in the bond market? A 10 percent rate would ruin the housing market, and a 20 percent rate would spell financial disaster for the country. Now we have the European Union printing up one trillion Euros to save the Euro. This frees up the money from bad loans (unredeemable) made to Greece. Where are investors going to put this money, in other markets? What’s a trillion Euros trying to find a home? Answer: Inflation. Notice, governments never question markets that reach to the sky. But have one that takes an ugly dip like the real estate market or the stock market and they hold an inquisition. Where to from here? Dow 30,000, Gold $3,000? So as the Dow Jones average rips through 40,000 next week, look for Obama to declare the recession over. Even though I am joking around here, this is the last party in town and they just refilled the punch bowl. IMF funding, hmmm! Sounds like some big bucks there, ever wonder whose money is being spent? Who’s in charge of this “One stop shop for loans with no collateral?” The United States of America pretty much runs the organization they have 17% of the vote and nothing happens unless they say so. Who’s in charge for our side?--- Tim Geithner and Ben Bernanke. At the last Senate hearing for the Federal Reserve, Bernanke got asked a question about the IMF and more or less stated he didn’t have enough information on the subject. Talk about a piece of lit dynamite and no one in the panel called Ben on it! Here's a graphical representation of how the United States fits into the IMF. It is our baby, we run it. There is absolutely no reason to bail out Greece. They had a walapalosa party; does the rest of the world have to pick up the tab? Do we keep the game going one more year, or let the chips fall where they may? There is Spain and Portugal with Ireland waiting in the wings. Germany may find 29 billion (over a time span of 3 years) for Greece, what happens when Spain comes knocking? At what point do these loans become grants of aid that have to be written off by the issuer? This wouldn’t be an issue to bring up when running for reelection in say Germany. There are two different goals here “Save the Euro,” and/or “Save the PIIGS.” Everyone is for the idealistic Euro. Europe is not ready to save the Greeks. The bar of soap is on the shower floor, and no one has any intention, to bend over and pick it up. Refinancing Greece’s debt, in a world economy that is plunging into the abyss, has very little chance of success. You are only adding more debt to the system. It could be time to cut and run. Sometimes doing nothing is the solution, the problem solves itself. My advice, go to the concession stand and get a box of popcorn and a drink and find a seat, the show is about to begin. In this episode, Ben is going to save the Euro with American Dollars from the IMF. Aw gee, I guess I spoiled the ending—sorry. The newspapers are all claiming that the housing market is coming back. Something isn’t quite right here. The banks aren’t about to loan any one money for a home unless they have a 20% down payment. Of course, if you want to buy a Fannie Mae foreclosure, all you need is 5% down and the government gets another bad loan off the books. This isn’t a bank loan; it’s a government loan that happens to be part of the national debt. The phrase "No skin in the game," seems to echo in the background. Then you hear about the 20% of house sales that are completely cash sales. You have to wonder, where did they get the money? With 1 out of 17 homes in the US facing the possibility of foreclosure and then we have 1 out of 5 buyers paying all cash? I find it hard to believe. Common sense suggests, why buy one house? Investors only need 20% down, buy 5 and share the risk with the bank, the interest rate can’t be beat. Three years ago, anyone that wanted a loan could have gotten one. And now you can’t get a loan without a substantial down payment. The marginal buyers (no doc’s) are gone and so is their demand for housing. The housing market is not coming back, the surge of baby boomers has peaked, the Silver Foxes are looking for smaller retirement homes, not the McMansions that have been built. Real demand is declining. Our government wants to keep home prices from collapsing so people don’t take a walk; otherwise Freddie and Fanny get more home loans to eat. They have painted themselves into a real neat corner; 5% down moves you in and of course they’ll throw in $20,000 for repairs. Right now the housing market is in the eye of a hurricane, enjoying the calm. The 5/30 interest only loans are starting to convert to conventional loans. Unemployment is getting worse. State tax collections are abysmal. On top of that, the baby boomers are getting ready to retire; they will be trying to sell their homes and move to Arizona (Mexico’s Northern most State). Why buy a home from a Silver Fox when you can buy one from Fannie Mae and get cash back? I just love these government programs, sure beats renting.